Forest trees are colonised by different species of ectomycorrhizal (ECM) fungi that interact competitively or mutualistically with one another. Most ECM fungi can produce sporocarps. To date, the effects of co-colonising fungal species on sporocarp formation in ECM fungi remain unknown. In this study, we examined host plant growth, mycorrhizal colonisation, and sporocarp formation when roots of Pinus densiflora are colonised by Laccaria japonica and three other ECM fungal species (Cenococcum geophilum, Pisolithus sp., and Suillus luteus). Sporocarp numbers were recorded throughout the experimental period. The biomass, photosynthetic rate, and mycorrhizal colonisation rate of the seedlings were also measured at 45 days, 62 days, and 1 year after seedlings were transplanted. Results indicated that C. geophilum and S. luteus may negatively impact mycorrhizal colonisation and sporocarp formation in L. japonica. Sporocarp formation in L. japonica was positively correlated with conspecific mycorrhizal colonisation but negatively correlated with the biomass of seedlings of P. densiflora. 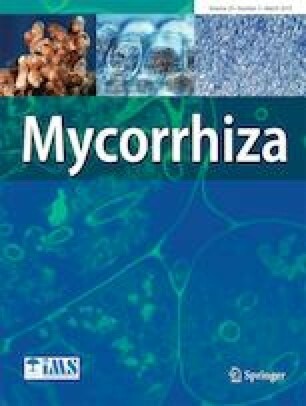 The co-occurring ECM fungi largely competed with L. japonica, resulting in various effects on mycorrhizal colonisation and sporocarp formation in L. japonica. A variety of mechanisms may be involved in the competitive interactions among the different ECM fungal species, including abilities to more rapidly colonise root tips, acquire soil nutrients, or produce antibiotics. These mechanisms need to be confirmed in further studies. The online version of this article ( https://doi.org/10.1007/s00572-019-00890-6) contains supplementary material, which is available to authorized users. We are grateful to Mitsuko Goto, Ruiyang Xu, Jiali Li, Suguru Tanaka, Masayuki Kubota for technical assistance; the staff of the University of Tokyo Tanashi Forest for providing the forest soils and the vacuum freeze dryer; Kazuhide Nara for providing the cultures of ECM fungi; Maki Narimatsu for providing the seeds of P. densiflora. We are thankful to Kenji Fukuda for providing insightful comments which improved this manuscript. We thank Dr. Jan Colpaert and two anonymous reviewers for revising and useful comments on the manuscript. This work was supported in part by a JSPS KAKENHI (granted to CL, no. 17H03824).